The Great Mother has a Soul and is alive. As are the other planets, they all have a Soul and a Spirit. For us if we have children we leave some of our Soul here on Earth, which is why those doing the Great Work often don't want children as it means a continuation until they have died, and if they have children it continues. Once we have completed the Great Work and our Soul is no longer on Earth, we don't return to the source, we become a planet and we create our own world. Until we have stopped the rebirth cycle and done the Great Work we are trapped in someone else's world. This is something you can not even begin to understand yourself though unless you do the Great Work, as it is hard to put into words. You are not aware of going to the source, as in if you body rots in the ground and a tree grows out of your rotting body, you don't know about it, and that isn't you. But if your DNA is still in someone else still alive, you can not move on. So you could say, we are our children. If you die and don't have children, but haven't done the Great Work, then you are just returned fully to the source, but you are not aware of it, it is just eternal sleep, so it is nothing to be afraid of. 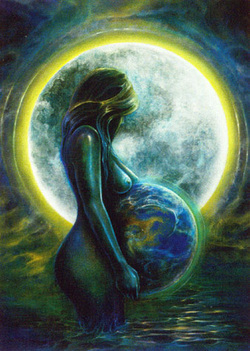 The Great Mother just uses your energy smashed into thousands of pieces to create new life. You can not create a planet without doing the Great Work, and if someone does that it means they have removed all the shadow self, or at least have full control over it, so planets are not negative, none of them are. But we can choose exactly how the planet is going to be. Some people want complete solitude as they feel completed without others being around, so they can be a fiery planet with no life on. Others, like ours, want to see new life flourish, so become a creator of new planets, eventually, if the people learn to listen to the Soul of the the planet through the Great Work, but it has many many levels to it and this is hard to explain. When you reach the point of Gnosis and full connection to Higher Self there are things you just know but can not put into words, words can not explain these things, as you just have to experience them yourself. Words are something we created, this is more than words. I am going to include some planetary magick sigils and rituals in my book which I am currently working on, they are VERY powerful, something the Eagles have been hiding from you for years. If you remember that these planets are not just objects and are alive, and are very old wise souls, you can begin to see why this has been kept from you. I should mention, just because someone has had children, this does not mean they should not do the Great Work. Actually they should even more so, because when someone of a line does the work, it makes it much much easier for those who come after. People don't seem to realise the true connection we have with family that no matter what we do with our life, it has an effect on our kin. This is why someone who comes from a family that say take drugs and drink all the time and are abusive, find it much harder to break free and do the Great Work, than those who come from a loving family. This is why we have our wilderness when doing the Great Work, to try to remove any negative influence from family members who try to stop us, as those who are trapped want to keep others trapped through fear and programming. If you are brought up in a family of those who do the Great Work, but choose to have children and continue the line, and they got far, then you have not much to do at all as the parent is passing that knowledge. So love or hate your family, they do effect you and you can effect your own children too. If you choose to not do the Great Work, you are leaving a much harder job for your children. It is all about growing up, the Great Work, because as children we feel the need to be attached to our Great Mother and are scared to leave her, but as we become an adult we feel ready to break free, and are no longer in fear of becoming a planet of our own, we feel safe and secure and without attachment, we have then completed the work. People who do the Great Work but have children, still don't feel ready to break free, or of course they might have had them first before starting. Either way, the Great Work is for anyone who chooses to become an adult and be responsible for themselves.